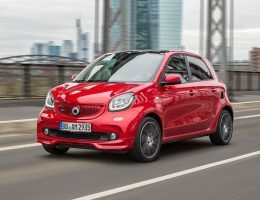 The 2017 Smart Cabrio is official ahead of its public debut in Frankfurt next month, with the first confirmed timeframe for its US arrival. 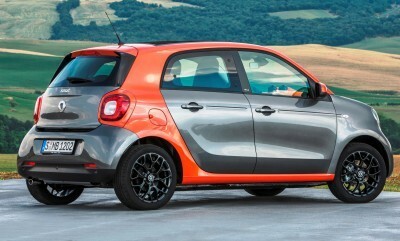 The overall rollout has been extremely slow so far, but US Smart showrooms are finally close to clearing their inventory of the existing — and deeply unpopular — model. Why bother bringing Smart back at all ? And why start with this cabrio? 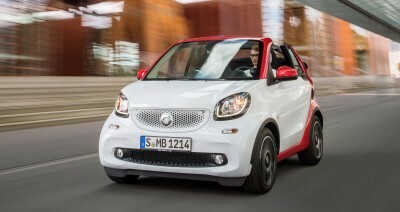 Smart is coming back mainly thanks to a new four-door variant of the rear-engine city car. 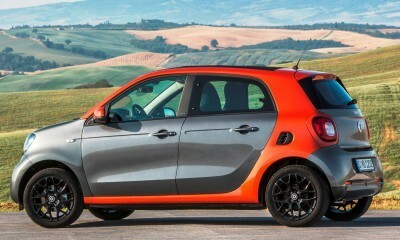 The larger model is expected to eventually compete with the Fiat 500 and base MINI Coopers, in theory. 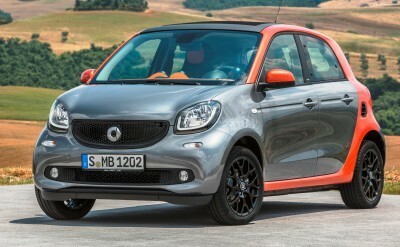 Bringing the ForTwo Cabrio back to the US will lead the charge for the new generation of models. Primary reasoning is that the Smart ragtop is the only version that was ever even vaguely successful here in America. While we’ve never driven any of them, we have heard very bad things. 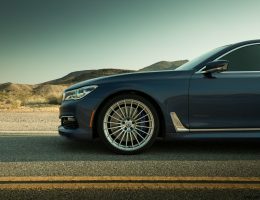 The new model is on an all-new and much wider platform — hopefully improving its roadworthiness outside tiny continental capitols. 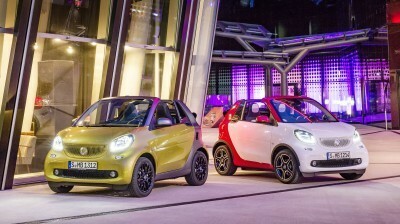 Premium pricing will again limit any Smart’s potential market share: we’d ballpark a price range starting from $15k and approaching $30k with every silly option. 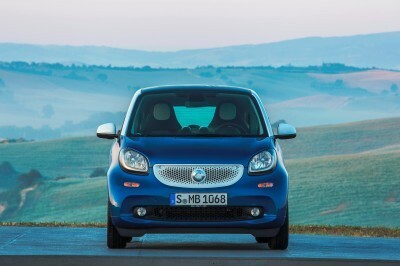 The countdown has started for the new fortwo cabrio, a particularly iconic variant of the new model series. The open-top two- seater will have its world premiere in September at the International Motor Show in Frankfurt. 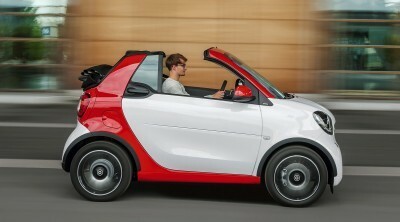 The new smart cabrio will launch in the United States in early summer of 2016. 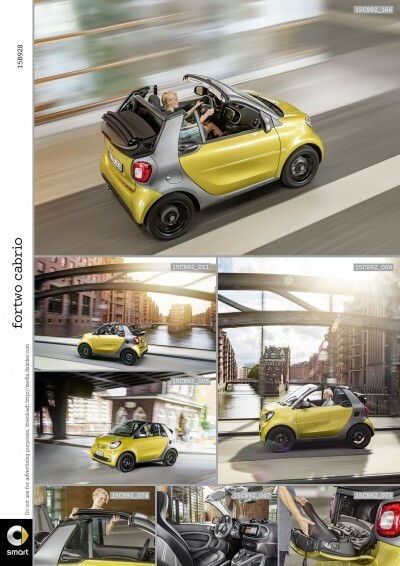 Three cars in one: at the touch of a button the new smart cabrio is transformed from a closed two-seater into a car with a large sliding canvas sunroof, or a full-fledged cabriolet with the soft top completely open. This enables the fresh air driving experience to be adapted to the weather or the driver’s mood. This flexibility offered by the “tritop” folding soft top and the removable roof bars is a special feature – and not just in this segment. 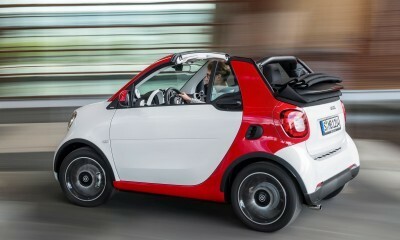 At the same time, the new smart cabrio is the only true cabriolet in its vehicle class. 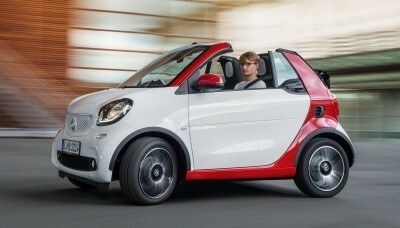 The new smart cabrio (length/width/height: 8.8/5.4/5.1ft) is clearly recognizable as a member of the new smart generation. The third model also embodies the smart design philosophy of FUN.ctional design, defined by two poles – the heart and mind. The design idiom is clear, purist and very progressive. This includes the typical silhouette with ultra-short overhangs, the clear lines, shapes and surfaces and, of course, the tridion safety cell. 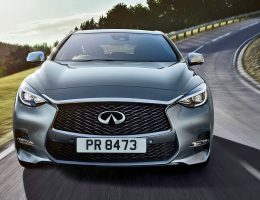 With the grill in a fading honeycomb design and the rhombic headlamps, the face is unmistakably smart. The B-pillar is narrower than on the closed variant and the styling of the tridion safety cell is more progressive, giving the smart fortwo cabrio an even sportier and more forward-focused look. Prospective customers can choose between three different colors for the “tritop” fabric soft top: blue denim (jeans look), red or black. The headlining is always grey. The removable roof bars that can be stowed in a compartment in the tailgate come in the tridion color. 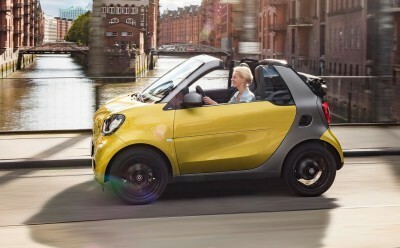 When the sun peeps out from behind the clouds, smart fortwo cabrio drivers can react quickly: the fabric soft top can be opened fully automatically in twelve seconds – even when driving at top speed. With the 3-button key the soft top can also be opened from outside the car by remote control. Removing the side roof bars enables a full-blown cabrio experience. The roof bars can be stowed on the inside of the tailgate. This stowage compartment in the tailgate also offers additional stowage space for small items. With an area of 19.4sq-ft the “tritop” fabric soft top is approximately four percent larger than its predecessor. The outer covering is made of a particularly lightfast polyacrylic fabric and the inside features a polyester/cotton mix. There is a rubber layer in the middle. The soft top has a total thickness of 0.8 inches. The rear windscreen is heated and is made of glass. 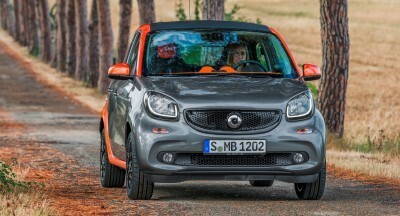 The new smart fortwo cabrio is the most rigid smart cabrio ever. The torsional strength has been improved by around 15 percent compared with the predecessor. The material mix comprises a high proportion of ultra-high strength hot-formed steels and maximum-strength multiphase steels. 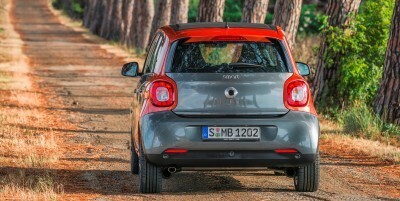 In addition, the cabrio has been specifically reinforced in decisive places in comparison to the coupe. 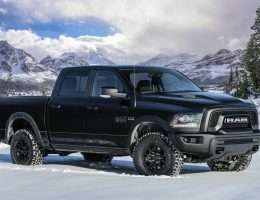 The modifications include a large steel cross under the vehicle, two torsional bulkheads under the vehicle at the front and rear and an inner tube in the A-pillars made of high strength hot-formed steel. 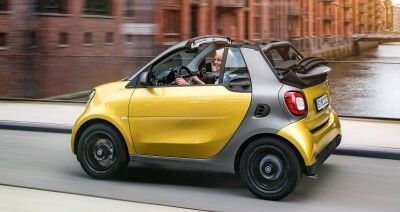 As well as meeting the requirements of mandatory crash tests, the new smart fortwo cabrio – with a safety concept that includes the tridion safety cell typical of the brand for efficient energy absorption – also passes additional Mercedes-Benz crash tests that often have much stricter requirements. This includes the “roof-drop” test. Here the body falls at a slight angle from a height of 50 centimeters onto the roof structure and the vehicle hits one of the two A-pillars. Advanced assistance systems which were previously the reserve of higher classes of vehicle help to prevent accidents. 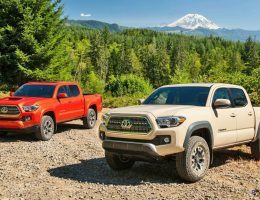 These include the latest- generation ESP® with Crosswind Assist and hill start assist (standard) and forward collision warning (optional). 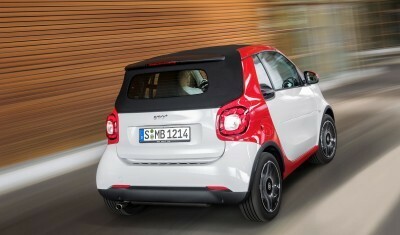 The new cabrio will be available with the same state-of-the-art three- cylinder engine as the coupe, rated at 89 hp. 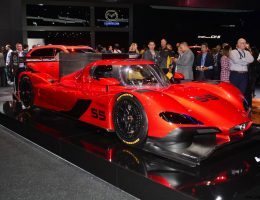 This engine can be combined with the five-speed manual transmission or the fully automatic twinamic dual clutch transmission. 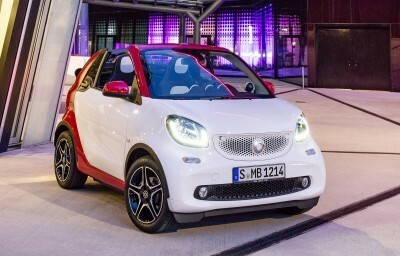 Needless to say, the smart fortwo cabrio has the agility typical of the brand – with the 22.8ft (from curb to curb) and 24ft (from wall to wall) turning circle, turning maneuvers are extremely simple. In addition to the four lines pure (standard), passion, prime and proxy, customers can choose from a large range of safety and comfort features. 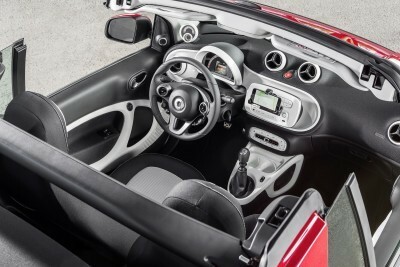 The high-quality and charming interior of the smart fortwo cabrio corresponds to that of the closed variant with standard features including a smart radio with Bluetooth® technology, automatic climate control, power windows, power steering, cruise control, a multifunction steering wheel, alarm system, and LED Daytime Running Lamps integrated into the headlights. A wind deflector is available as an option. 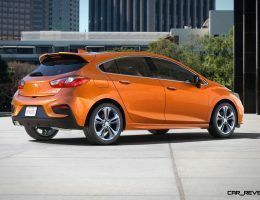 The interior styling is sure to delight and is characterized by a “dynamic loop” as a signature feature throughout the interior – emotional sweeping lines which feature on the dashboard and doors, for example. Figures for vehicles with twinamic in brackets. -40 degrees centigrade with a completely iced roof: in this case overload protection protects the soft top’s drive motor. The car wash test ensures that smart cabrio passengers always stay dry. 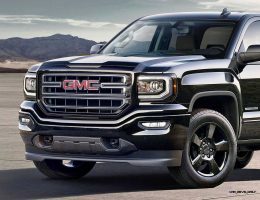 At 500 cycles, the requirements correspond to those for the coupe. 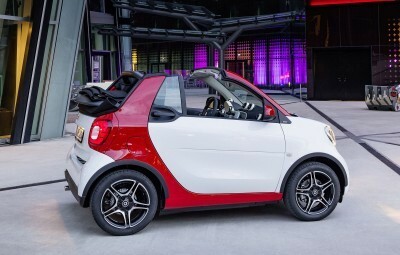 In addition to this testing in the development phase, every single smart cabrio is also tested for leak-proofness: at the end of the production at the Hambach plant every vehicle is sprinkled with a standardized amount of water for seven minutes. The developers tested the maintenance of a draft-free interior in the Mercedes-Benz wind tunnel with the help of the dummy “Tanja.” She is fitted with a total of 16 speed sensors on her neck and arms which allow the flow speeds of the wind in the interior to be measured. In addition, there is extensive overall vehicle testing on testing grounds and roads of different quality around the world. 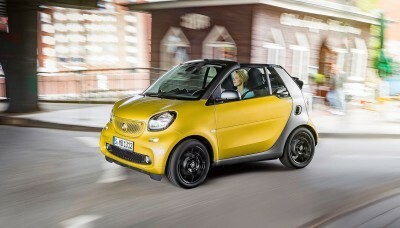 At the International Motor Show in Frankfurt in 1999, smart surprised the world public with a number of new model studies. 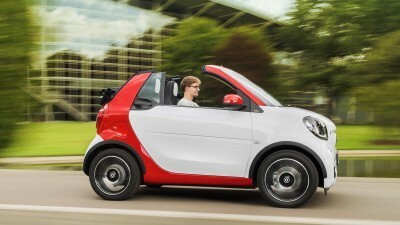 A cabrio version was presented that was based on the smart city-coupe. 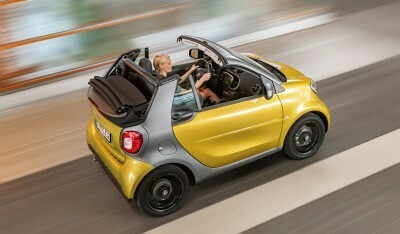 This model opened a whole new dimension to the “closed” micro car community by opening up the roof. 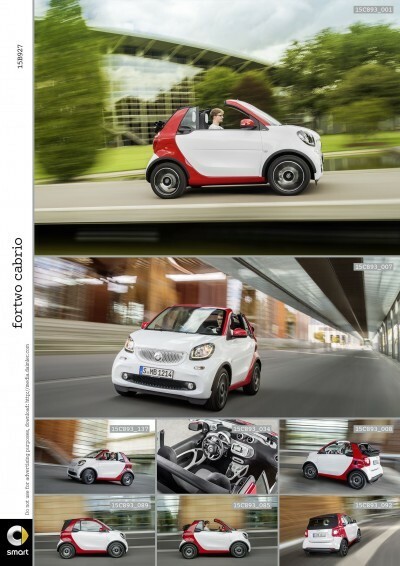 The smart cabrio offers pure joy of life. From the spring of 2000 the world’s smallest production cabriolet rolled off the production line and onto European roads. Since the first model change in 2006 the soft top has been fully automatic. 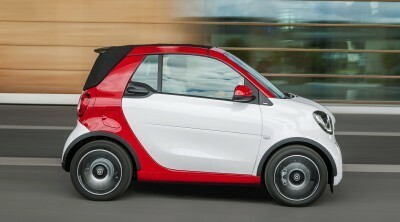 For the third generation, available from 2010, new soft top colors in red and blue expanded the range of colors.